The Elite Care shower commode is an self propelling commode chair ideal for the home, residential or hospital environments. Made with a strong, robust frame the commode is as comfortable as it is durable. The powder-coated steel has anti-corrosion qualities that make it extremely hygienic and easy to clean. The PU seat and armrests offer maximum comfort and stability for the user when being transferred, whilst the leg rests and footrests provide the utmost support. Manoeuvrability is particularly good with the Elite Care self propel shower Commode as it incorporates a push bar and brakes on the self propel wheels making pushing and moving the commode effortless. The armrests are removable, as are the footrests, providing easier access and making transfers simpler for the user and carer alike. PU wipe clean seat and armrests offer maximum comfort and stability for the use. Rear wheels have lockable brakes. Swing out removable foot rests. Removable cut out in the seat for commode use and cleaning. Armrests are height adjustable and removable. Removable PU backrest covering. with a waterproof backrest webbing underneath. Folds once the backrest and seat have been removed. 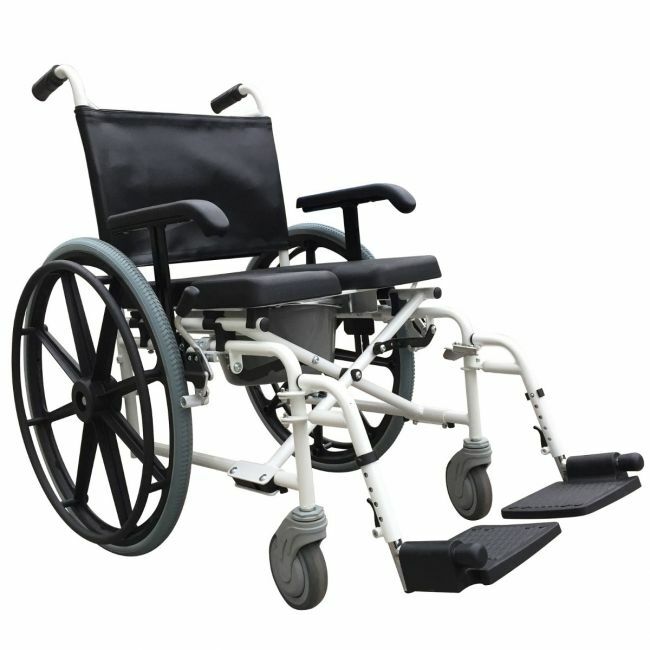 Height - 89cm / 35"
Depth - 112cm / 44"
Depth without footrests - 84cm / 33"
Seat Height - 52cm / 20.5"
Gap between armrests - 43cm / 17"
Seat Depth - 43cm / 17"
Arm Height from seat - 10cm / 4" to 22cm / 8.5"